Richard Mackson is an award-winning sports photographer, inventor and entrepreneur whose career has spanned over 40 years and taken him around the globe. He has photographed World Cup Soccer, 14 Olympic Games, Rose Bowls, Kentucky Derbies, NCAA Final Fours, BCS Championships, NBA Championships, Super Bowls, Stanley Cups, and countless other national and international sporting events for many of the country’s largest national sports, news and entertainment publications. In 2009, Mackson retired as the Director of External Relations and Vice President, Office of the Chief Technical Officer at Kodak. Aside from photography, Mackson consults on projects in areas of digital workflow, IT infrastructure and home automation. As an inventor, he develops new gadgets and methods that innovate both the capture and movement of digital images and information. 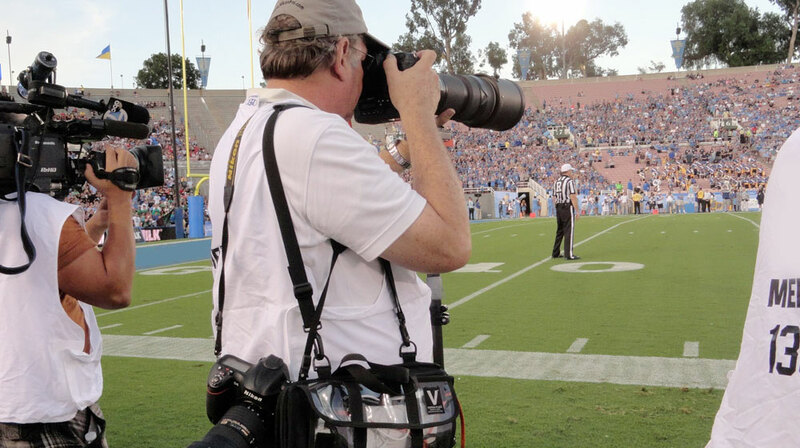 In Mackson’s highly-competitive world of photographing sporting events around the world, time is of the essence. With the nation’s top-tier print and online publications fighting for the eyes of an audience that demands immediate information, media outlets depend on photographers like Mackson to shoot and transmit their photos to the editors in as close to real-time as possible. While many of the stadiums and sites that Mackson shot in were equipped with Wi-Fi networks, these networks were not necessarily dedicated for media use and were often overloaded with users or did not have the range and strength to be usable to Mackson and his colleagues. Mackson explained that his primary camera, which is the professional Nikon D4 digital SLR, features an Ethernet connection with a built-in Internet client with an FTP server, but he needed a bulletproof wireless Internet connection. Mackson explained that everything came to a head in 2010 when he was assigned to shoot events at the Syracuse University Carrier Dome, the largest structure of its kind on a U.S. college campus. Mackson told the university that he wanted to install an access point that would give him wireless access throughout the venue. He was told “good luck, nothing would work” in that environment, but Mackson set out to find a solution. To operate effectively in a complex stadium environment packed with people and RF interference, Mackson knew he would need a wireless system that could provide 5 GHz connectivity over extremely long ranges. His research led him to the EnGenius family of long-range outdoor wireless access points. He installed an ENH500 5 GHz outdoor access point in the press box and tied it into the stadium’s existing network infrastructure. To the amazement of Mackson and the IT staff, it worked, marking the beginning of his fascination with and dedication to the EnGenius brand of wireless networking products. Mackson has deployed EnGenius products at the majority of the venues where he shoots photographs. Upon receiving permission from the venue, Mackson mounts an EnGenius access point inside the stadium and simply plugs in to the existing network infrastructure. Over his shoulder, Mackson carries a wireless pack that he invented leveraging a battery-powered ENS500 5 GHz outdoor client bridge or ENS202 2.4 GHz outdoor client bridge which connects to his camera and provides a high-speed, long-range wireless bridge to the Internet. Using this EnGenius-enabled wireless system, Mackson is able to shoot and transmit his photos to his editor from the field as he takes them.